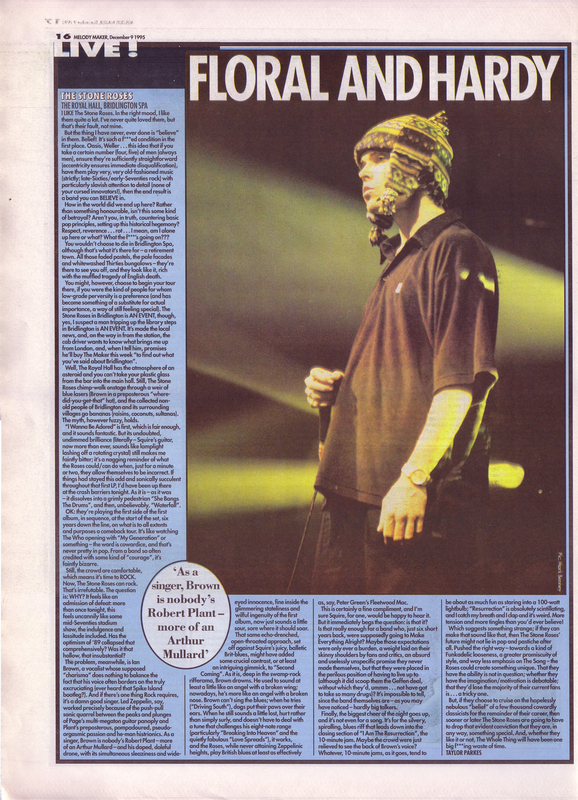 Taylor Parkes reviews The Stone Roses, 9th December 1995. Photo Mark Benney. It’s terrible but it made me smile; and the glaring indignity of the fact that Brown has managed to carve out some sort of post-Roses career while Squire has retreated to his painting is underlined by the subsequent review. Brilliant, I remember this. Classic Taylor Parkes piece. You’d never read a review like this anywhere now. Interestingly enough, I find the Stone Roses very boring, but it’s great to see reviews like this. Hopefully you’ll publish more. Spot on review. I was a big fan of The Stone Roses in the late 80’s but they were absolutely dreadful without Reni on the 1995 tour; I saw them at Brixton in Dec and Ian Brown’s singing was unbearably out of tune and he looked like he was as miserable as we were. Stone Roses all-nighter at Brixton was monumental!